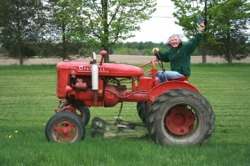 Sue Decker grew up on a 40-acre farm in Nazareth, PA raising chickens, ducks, horses and growing vegetables. She worked and studied in New York City in many different avenues spanning video, publishing, design, holistic health and CSAs. Her core membership at the Park Slope CSA in Brooklyn, New York inspired her to launch full-time into farming in upstate New York at Windflower Farm in 2004. There, she learned the ins and outs of organic vegetable production for a 300-member CSA, delivering into New York City once a week. The following year Sue went to Charlestown Farm in Phoenixville, PA where she undertook the management of a 150-member CSA and assumed stewardship of Charlestown Farm in 2006, successfully guiding the farm for 3 years thereafter. In 2009 Mark and Sue were married, moved to Stuyvesant, NY and started Blue Star Farm. The 2009 growing season was the wettest season on record in 100 years for the area. Whew, glad we got that one over with! Mark Decker bops back and forth from the farm to New York City where he is the Director of Digital Imaging at Forbes Magazine. Having grown up in Detroit, lived and schooled in London and Vienna, and raised two children in Manhattan, big city Mark's farm resumé is sadly lacking. His status as Sue's favorite intern will help him get up to speed. Currently, his ability to recognize vegetables as they sprout in their seed trays is improving daily. Boone joined us in December of 2009. He is an avid hunter of voles and mice and can be seen fervently digging in the fields often. He also has a fascination with birds and chases all raptors that deem to fly across our property. (He has never caught one.) The chickens are pleased with this arrangement. He has LOTS of energy and loves to play ball and chase sticks, although he doesn't give them back. He is quite fond of winter and prefers a snowy day to summer. He eats all his veggies, except for fennel. Red peppers are one of his favorites. He knows the word "compost."